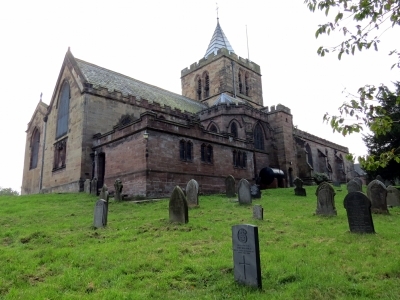 Although Joseph obviously lived in the area, since he was buried in Hawarden and there was a gravestone, I cannot find him nor any entry in the 1911 census. The Hawarden Parish Magazine casts a little light on where and with whom he lived (Mr. & Mrs. Burns) but I cannot find them on the 1911 census, so wonder if they came to live locally after the 1911 census. Can anyone help with more family information about this soldier? UK, Soldiers Died in the Great War, 1914-1919 for a Jack McDonough accessible on www.ancestry.co.uk confirms the regimental details above and tells us that he was born in Liverpool and enlisted in Shotton. His medal card also on ‘Ancestry’ details his medals and tells us that his first Theatre of War was France and he entered it on the 18th December 1915. The name of “Jack” appears on this document, was this a clerical error or was Joseph known by that name? The Royal Welsh Fusiliers Archives includes a data base of casualties which has an entry for Joseph McDonough which says he was wounded on the 5th July 1916. He died in Bramohott Military Hospital on the 14th July 1916 and his body was brought home to be buried at Hawarden..
Joseph is mentioned in the book “Soldiers Died in the Great War 1914 – 1918 Royal Welsh Fusiliers Volume 28”, this also tell us he was born in Liverpool and enlisted in Shotton. Joseph McDonough in the UK, Army Registers of Soldiers’ Effects, 1901-1929 tell us that he died of wounds in Bramohott Military Hospital and gives the sole Legatee was Mrs.Agnes M. BURNS who received £3 2s 5d on the 29th November 1916 and his War Gratuity of £8 10s.0d. on the 30th September 1919. 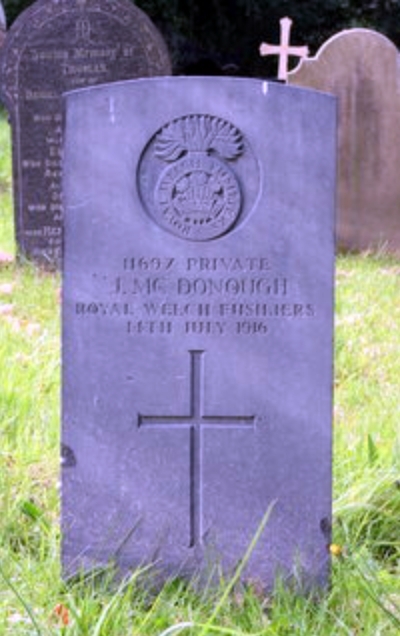 Joseph was buried in St. Deniol’s Churchyard, Hawarden – St. Deniol’s Churchyard – East of Church – B 6 Private J. McDonough R.W.F. 14 July 1916 11697. He is also named on the Sandycroft War Memorial in St. Francis’s Church.